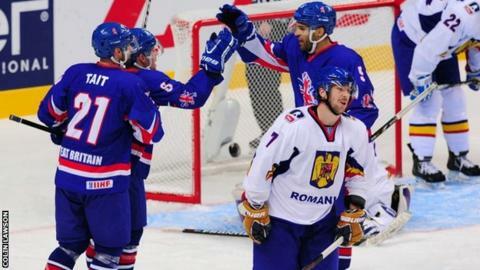 Great Britain recovered from their opening World Championship defeat to beat Romania 4-1 in their latest Division 1 Group B match in Lithuania. Ben Davies, Jonathan Phillips and Colin Shields earned a 3-0 lead before Otto Biro scored for Romania and Mark Garside added a fourth to make amends for Sunday's 4-0 loss to Croatia. Britain play three more matches before Saturday as they seek promotion to Division 1A after relegation last year. They next play Lithuania on Wednesday. GB head coach Doug Christiansen said: "We played well with energy and commitment. "It was really a matter of going out and executing. A win's a win and we will take it and move on to the hosts on Wednesday."